Front water views from all front windows, lawn and deck. Sunset view from the roof deck. Gas grill and outdoor shower. 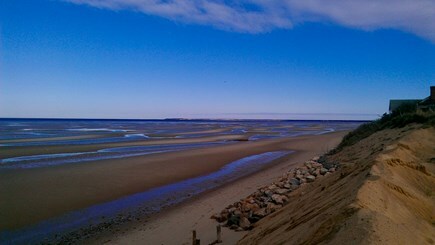 One minute walk to stairs, sand bars and tidal pools at low tide. Dining area (AC unit is in, but not in picture). New appliances, including dishwasher, wine storage. Kitchen and hallway to BR#2. 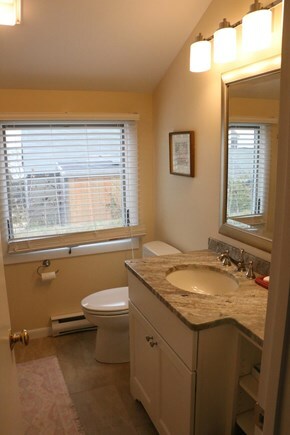 One of two, newly updated full bathrooms. Master Bedroom with AC, water views. Twin BR great for kids. 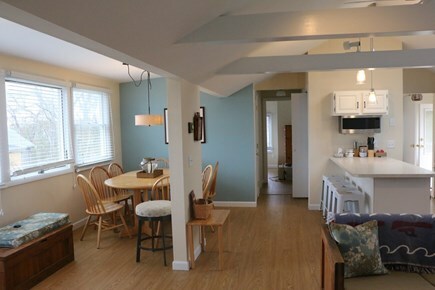 Family room, Wifi, cable, ceiling fan, AC, water views. Enjoy sweeping bay views and nightly sunsets. 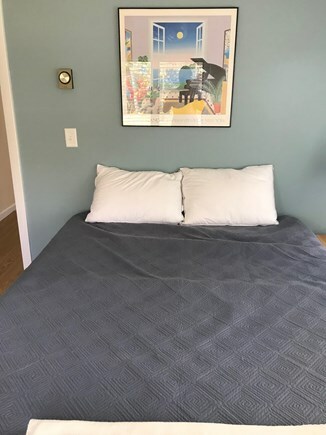 One minute walk to the beach as shown by photos, and we are also visible in adjacent listing 4635. 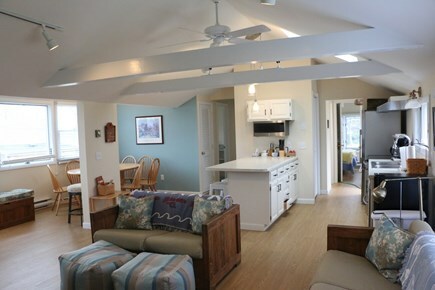 The pace is easy, enjoy the best of both worlds: A fully updated, but traditional Cape Cod cottage. Stay in flip flops and walk the beach, or enjoy the view while you are grilling your dinner and watching the sun set. Newly renovated in 2017: The house has 3 bedrooms (Queen, Full and two Twins), Wifi, cable, dishwasher, laundry, air conditioning and outdoor shower. All appliances are new, as are two full bathrooms. 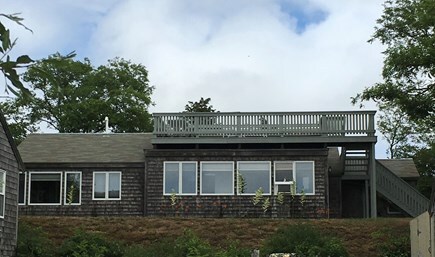 Enjoy sweeping, sunset views of Cape Cod Bay from the roof deck or the front lawn. This is the perfect spot for families in small, private neighborhood on a quiet, sandy cul-de-sac, 200 feet from a private beach. The Wellfleet Drive-In Theater, Cape Cod Rail Trail, Wellfleet art galleries, and Cape Cod National Seashore, are just a few of many area attractions that are close by. A short walk will bring you to miles of tidal pools and sand bars to explore at low tide. Swimming, kayaking, and shelling are just a few of the many things awaiting you at Campground beach. Once you stay, you’ll see why this is our special place. Additional pricing info: There is an additional $200 cleaning fee. 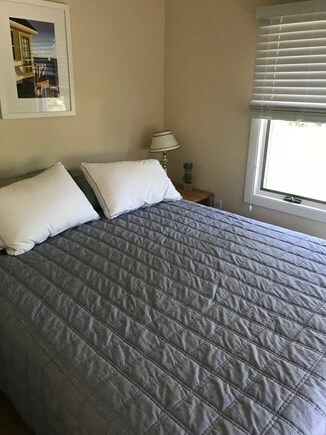 Tenants are to provide their own linens and towels. State and local taxes of 12.45% will apply. 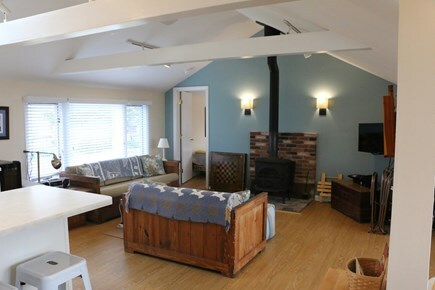 Hello and thank you for your interest in our cottage which is new to the rental market. My family has been coming to Eastham for over 50 years and are excited that you would like to share what has drawn us to this area: beautiful sunsets with a laid back vibe. 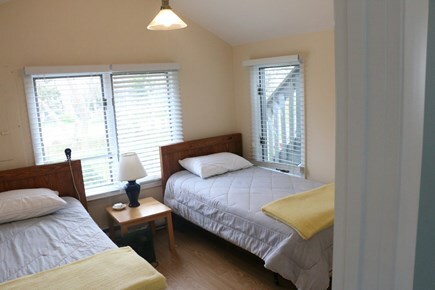 Our cottage, located on quiet sandy private road, is steps away from the beach. 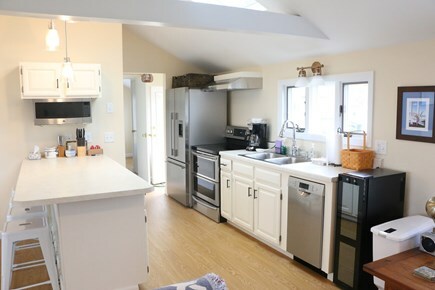 Recent renovations, including new bathrooms and kitchen appliances, have given our cottage a hearty refresh. Cape Cod Bay sunsets are not be missed from the roof deck. Eastham has drawn our family for over 50 years because of its unique characteristics: easy going vibe, variety of beaches: the tidal flats on the bay side and the majestic dunes on the ocean side; National Seashore Visitors Center, Cape Cod Rail Trail, family friendly restaurants, and it's easily accessible to many Cape Cod attractions including Provincetown, National Seashore beaches, Orleans and Chatham shopping, charter boats out of Rock Harbor, area art galleries, the Wellfleet Drive In Theater plus many more.